I recently acquired a Behringer CC300 Analog 3-D Chorus Effects Pedal that supposedly takes after the Boss DC-2 pedal. I also picked up the Behringer Vintage Analog Delay Effects Pedal as well which has similar good reviews. Now I would likely bet my money that the Boss DC-2 is a better pedal in addition to the better build quality. The VD400 takes after the Boss DM2 if correct and likely the DM2 is the best of the two as well. So this article is not about comparing Berhinger and Boss or even to indicate whether it’s a suitable replacement or not. I actually have never owned much less heard the Boss DC-2 or DM2 so I really have no idea how they compare anyway. What I can say is that both the CC300 and VD400 sound very good with my Korg Poly-61 Synth which I’ve been using them with lately. 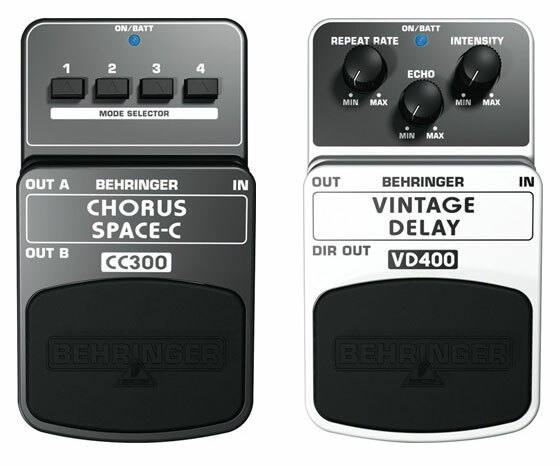 The Berhinger VD400 is outstanding to my ears and I really enjoy using that delay pedal very much. It has a very nice analog warm delay that trails very well. I’ve had zero problems with plugging any synthesizer into the VD400. The build quality is plastic and not as durable as the Boss pedals of course, but for working in the studio or at home the build quality is fine. I also don’t slam the pedals on and off that much, but rather I keep them on all the time so quality of build is not such an issue with me. The CC300 also sounds excellent but it does have one issue that is common among users. The Behringer CC300 does not handle the hot line signals of most synthesizers very well. On my Korg Poly-61 I have to use decent quality guitar cables, a good mixer, and have my synth set to “Low” Output on the back. I can then get the level up to about 8 for the CC300 Chorus and it sounds great. 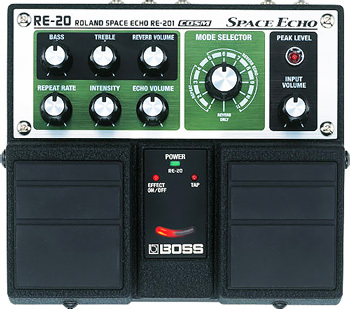 The CC300 Chorus pedal distorts very easily with many synths so you have to be careful. I also don’t believe it’s a sign of a broken CC300 rather it merely is just designed with a preference for guitars. I plugged my own guitars into the pedal for testing and the CC300 worked perfectly despite getting distortion on my synths at times. The sound is warm, lush, and very nice for thickening up a synth and I like the CC300 very much. Again I could get a Boss DC-2, but those run anywhere from $300-500 last I checked on Ebay in various conditions. I bought the CC300 for $30 and I must say it’s a great bargain for an analog effect pedal that does an alright job. Coupled with the analog VD400 delay it’s gets the sound I crave very nicely. In Japan, Behringer pedals have become very popular. The Boutique pedals in Japan are much more expensive then what you can get them for in the States. So, lots of Japanese musicians go for the Behringer. They are widely available over here but some models like the Analog VD400 and CC300 are selling out fast. I am particularly interested in what Behringer effect pedals work best with synthesizers. If anyone has experience with Behringer and their synths, both good and bad, please comment. I’d love to hear your thoughts. Thanks! This was totally unexpected, but yesterday I brought back a near mint Korg M50 Blue Edition Workstation from a used music shop nearby. The guy was practically giving it away for several reasons. First, one of the keys was not working. Second, the power jack on the back was cutting out a bit. Third, he didn’t know anything about it and thought it resembled a toy in looks and feel. He also thought there was a screen problem with the M50 because he noticed some vertical lines and felt the quality was not that great. Well duh! The Korg M50 is does not necessarily win any awards for build quality. Obviously I said I’ll take the piece of crap his hands, but first I wanted to test it out and hear out it played. UNBELIEVABLE!! Wow, the M50 can sing. I really was impressed with the EPs, Organs, and many of the drum kits which many had that Urban Rnb feel. I think I spent about 20 minutes playing the M50 and just couldn’t stop. What a sweet keyboard for fun and inspiration. I had heard extremely good reviews on the M50 but had never seen one around. I also liked the blue color and realized it was a limited edition M50. That made it more fun too. So, I picked up the Blue M50 and took it home. When I got home I found soldering the power jack was an easy fix. I also found the problem with the broken key and fixed that as well. I researched the touch screen and found it to be normal for it to look slightly funny and not so crystal clear. I personally think it looks perfectly fine and there likely is nothing wrong with it. Everything else about the blue M50 is near mint condition. I played quite a few combis and programs noticing all looked well. The Korg M50 really plays superb and I must have spent several hours today nonstop performing with it. Changing voices, drum beats, etc was a snap and it was extremely fun to create new beats with the sequencer and dual arps. I have a Korg Triton Classic and Rack so I’m pretty familiar with the Korg side of doing things. I also don’t miss at all a sampler. I have my Roland Fantom X7 and XR for that and I personally like them the best for my purposes. The Korg M50 is just great for the M3 sounds, dual arps, RPPR, and sequencer. Polyphony is enough and the keyboard is ultra light. I also think the blue is a super cool color. I have too many black and silver, so blue fits nicely. Overall I am very impressed with the all around great performance of the Korg M50. You do have to be careful of the build quality and I also find the keys to be actually pretty decent. For those that think they are bad, just check out the keys on the Roland Fantom Xa. Those are the absolute worst keys I have ever played. The Korg M50 keys are very similar to the Korg X50 which I also like. Someone mentioned once that they are actually quite fast keys, meaning you can do runs rather quickly. I would tend to agree. My only problem with the keys are that it’s difficult to play up close in between the keys. They don’t press down easily when doing sophisticated chords up top so that will take a tiny bit of practice getting use to. For funk and Neo-Soul which I like, the M50 works fantastic. In fact, I love Gospel music and think the Korg 50 would make a fine performance keyboard for that genre. It simply can cover all types of music and very well I must add. The Korg M50 is a very pleasant surprise. Today I just found a cosmetically mint condition 1978 Roland SH-1 Analog Synthesizer at a remote used audio and music shop here in Nagano-city, Japan. It was tucked away on the bottom shelf inside the original hard shell Roland case. This is the same shop where I found my Korg Poly-61, Roland Juno 106, and Roland Juno 6 Synthesizers over the past couple of years. I usually frequent this shop about once or twice a month. I tested the SH-1 for about 30 minutes and didn’t find one single problem with it. I was amazed at how stable it was. It really looked new and likely was kept in a closet for quite a few years. It was definitely well taken care of. The used shop was selling it for $400. I asked if I could use the store clerk’s computer behind the counter to quickly check some info. I actually checked Ebay to see what they had been selling for lately. I noticed a couple recently sold for $800 and $1000 in excellent shape. I told the guy I would buy it but sounded a bit reluctant mainly because I didn’t know if I needed another synth and also the fact that I knew very little about the synth. He might have mistook that for me thinking it was expensive. I previously bought a synth from the same store a few weeks prior and so he knocked the price down to $310 for being a good customer. Geez, I couldn’t believe it. Of course I grabbed it and it’s been a lot of fun playing with it after getting home today. It’s really a nice synth and a fun story that I often encounter here in Japan. I have no idea what the Roland SH-1 is worth though, but I feel I got it for a good price and I’ve heard they are very hard to find in some parts of the world. I had never seen or played one before until now. I’ve originally been looking for a Roland SH-101, but I suppose this will do for now. The Roland SH-1 came with the original case and a photocopy of the Japanese manual. On the outside it really looks almost brand new. I read the Roaldn SH-1 was used by Vince Clarke and Depeche Mode. Amazing! Until I get a video of my own up here is a great video of someone showing the capabilities of this synth. He does quite a few different things with it and I found it interesting to watch. It actually helps me in programming the Roland SH-1 myself as I can see how he sets the sliders. After I picked up the Yamaha RY-20, I knew I had to find a Yamaha TX81Z. Together these two would sound fantastic and I’m excited to have finally found a TX81Z here in Japan. I already have a Yamaha V50 which is a similar 4 Op synthesizer workstation. The TX81Z if correct is 12bit and uses the synthesis chip is called OPZ. 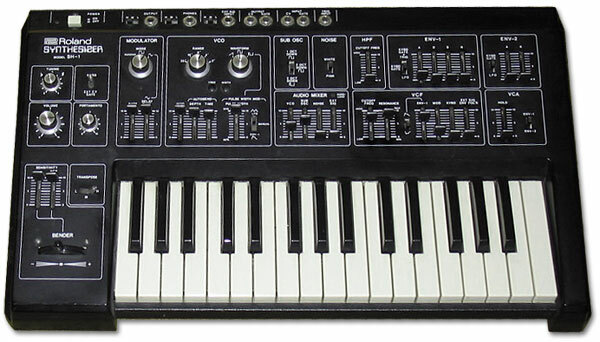 The Yamaha V50 is 16bit and uses the synthesis chip version OPZII which is slightly different. Coupled with the older chip and the 12bit sound, I really think the Yamaha TX81Z sounds great. 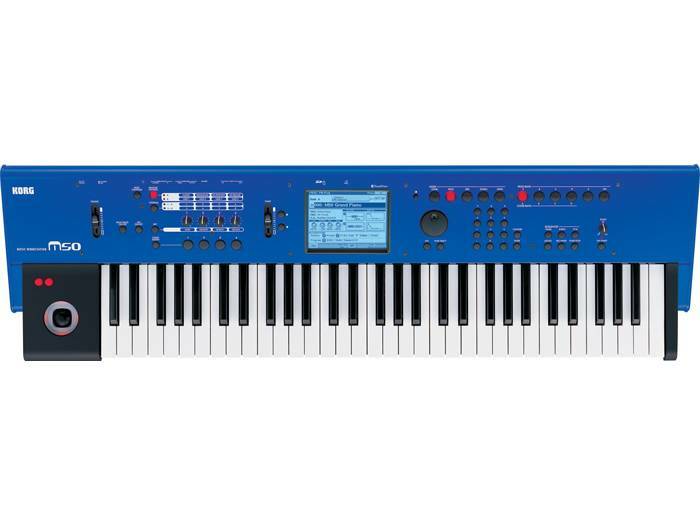 The Yamaha RY20 uses the AWM engine which incorporates 12-bit PCM sounds. Thus both the Yamaha TX81Z and RY-20 are 12 bit. I believe the Yamaha TX81z was released around 1987 if correct while the RY-20 was released in 1994. I also have a Yamaha RX-7 which was released in 1987 so would compliment the TX81Z just as well. 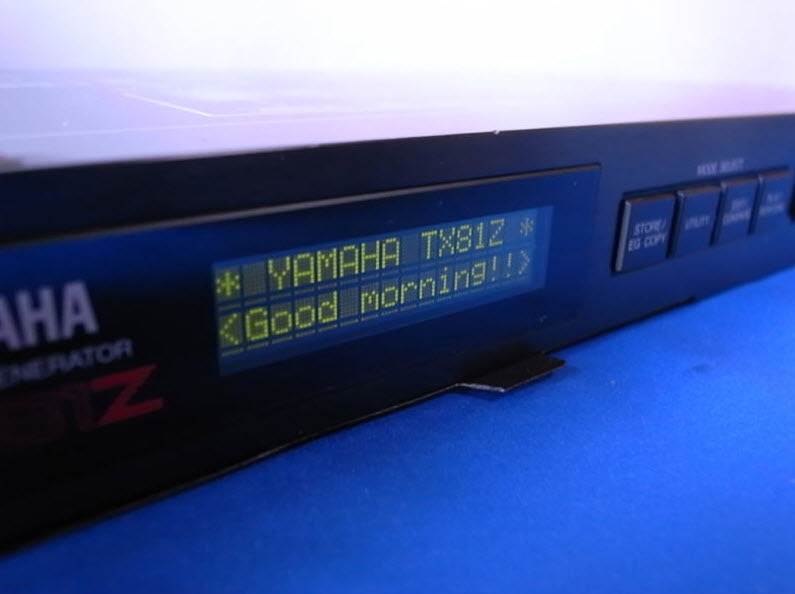 The Yamaha TX81Z has drum sounds also and can be triggered with either the RX-7 or RY-20. Another big reason I picked up the Yamaha TX81Z is because all of the TX81Z sounds can be used in the Yamaha V-50. However, the V-50 editors are a bit buggy whereas the TX81Z editors are pretty solid and reasonably supported. It will be nice to be able to edit the Yamaha TX81Z with the computer and then load the newly created patches into the V-50. It will also be easier to audition the sounds on the Yamaha TX81Z since it’s a rack based tone generator and much easier to handle than the V-50 synth which can take up space if I’m not using the keyboard right then and there. A few other points are that lately I’m sliding more towards using Analog synths and the 12bit keyboards such as the Yamaha DX7, Roland W-30 sampler, and the Casio CZ5000 sound great alongside analog synths. The Yamaha TX81Z should mix well with that warm gritty sound. Finally the Yamaha TX81Z was used on many late 80’s and early 90’s dance, hip hop, and Rnb oriented recordings. I am particularly interested in the New Jack Swing sound which both the Yamaha TX81Z and early Yamaha drum machines like the Yamaha RY-20 were used. The Yamaha TX81Z is a very underrated tone generator and synthesizer. It’ll be fun working with it! Stay tuned for updates.